We think of cows as herd animals, without much intelligence or social organization. But recent research has shown that they're smarter than we knew. And now, a new study suggests that the social networks of cows are a lot more complex than biologists had imagined. 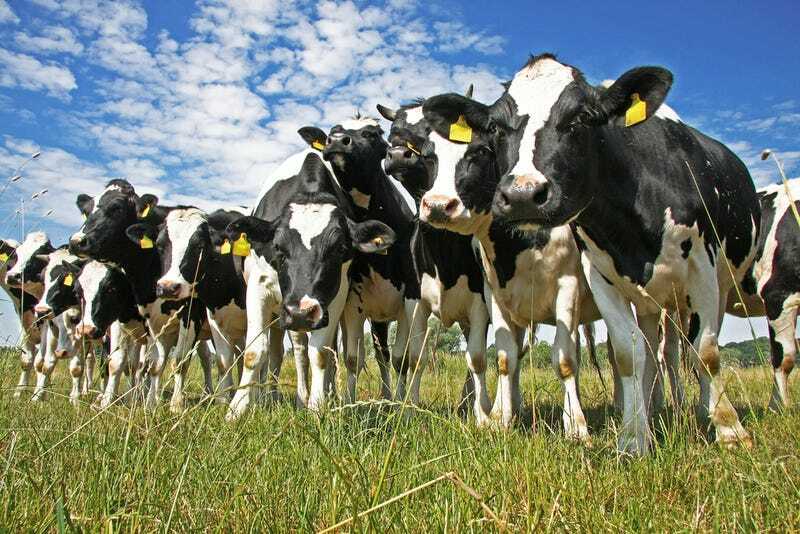 A group of researchers, let by Shi Chen at the University of Tennessee, spent a week analyzing the behavior of 70 Holstein-Friesian calves, continuously measuring the position of every animal with RFID tags. The research team — which defined social contact as any time the animals came within a foot of one another — produced a remarkable 9,000 data points per calf. Their conclusion: social contacts between cows are not random and can change significantly within a single day. The calves have the strongest social contacts while feeding on hay rather than on grain. This is probably because cattle spend longer feeding on hay to re-ruminate having eaten grain. During feeding time the cattle compete with each other for food at the grain bunk and therefore cannot always eat with an intentionally chosen partner. So the contacts around the grain bank may not necessarily reflect social ties. However, after feeding on grain there is less competition and the cattle can go with a chosen partner to the hay. "It is only the contacts around the hay bunk during feeding time that may attribute to the real social ties," the researchers conclude. That should have significant implications for the way animal behavioral specialists study social networks of other animals, particularly in the wild…..What's more, the key finding is that it is important to distinguish between random contacts and social ones—although this can only be done with the aid of detailed knowledge of the animal habitat and behavior. Perhaps the most important application of this kind of work is the ability to model the transmission of disease through an animal social network. Until now, this has usually been done by simulating how the disease transmits from one animal to another. This latest work shows that the network allows multiple pathways to be set up simultaneously. So future simulations should be to take this into account. The research paper, "Temporal Dynamics of High-Resolution Animal Social Networks: What Can We Learn from Domestic Animals?," is available online at the Cornell University Library.